Melaleuca fulgens is known as the Scarlet Honey-myrtle and is an erect shrub reaching a height of three metres. The leaves are narrow, aromatic and up to four centimetres long. Flowers may be scarlet, pinkish-red, apricot or purple. Our specimens have purplish flowers. We are always on the lookout for the scarlet-flowered form. The blooms are carried in lateral spikes up to five centimetres long. In our cold climate garden plants bloom for many months starting in mid winter. Light pruning, after flowering, will keep plants bushy and blooming bounteously. The Scarlet Honey-myrtle is a native of south-west Western Australia and is one of a number of spectacular Melaleucas from that part of the world. 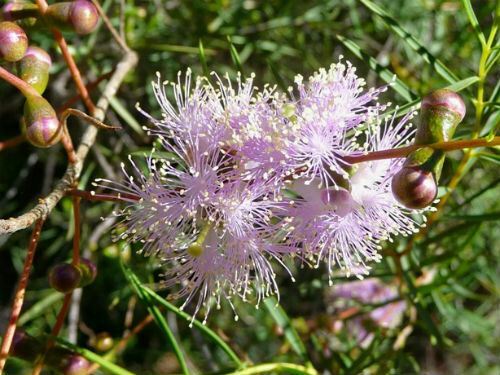 Melaleuca fulgens could be grown in native shrubberies where the eye-catching blooms would be a feature. Propagate from seed or cuttings. We always propagate from cuttings taken from our mature specimens. The progeny, from these plants, flower years sooner than seed-grown plants. The species name means brightly coloured and, of course, refers to the flowers. The species was collected by Robert Brown on the south coast of New Holland prior to 1819. Melaleuca fulgens was described and illustrated in The Botanical Cabinet. This was a 20 volume series describing the exotic plants cultivated in a London nursery in the early to mid 1800’s. In Volume 4 (1819) M. fulgens was mistakenly described as a native of NSW and called the Splendid Melaleuca. The photo drawing accompanies the Botanical Cabinet description.